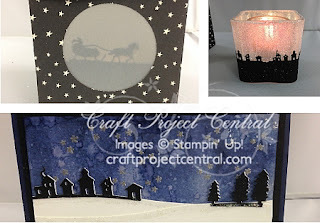 Just Julie B's Stampin' Space: Last-mInute Christmas Gifts! We all have that one holiday gift we forget to buy, don’t we? The new neighbor, our hair stylist, Uncle Joe who just moved back to town…forgetting a gift for any of these could cause more stress during a season that should be fun. If you have a last minute addition to your list, here are a few ideas that are quick and relatively simple. Best of all, they use products that almost every crafter keeps on hand. The projects use the Jingle All the Way Bundle to create gorgeous gifts anyone would love to receive. They also make beautiful home décor pieces for your holiday decorating. And since they’re winter themed, they can stay up into the New Year. This fun and practical project was made by Buffy Cooper, and it's the Bonus project for the month of November over at Craft Project Central. Bonus projects can be obtained by subscribing to two or more months in a row, putting the Craft Project Central badge on your blog, or by referring a friend and when they subscribe, letting us know.